The Phoenix mini-kiosk, from AML, is a full-featured, general purpose mini kiosk with a wide variety of application possibilities in different vertical applications. In retail stores it becomes the perfect customer portal for price lookups, stock checks, gift card balances and much more. In commercial or industrial applications, the Phoenix is an ideal-time clock, an access control device, or a data collection terminal. The 8585 and 8595 are the latest rugged vehicle mount computers designed and built for the tough demands of such environments as warehouses, ports, manufacturing plants and airports. These rugged vehicle mount computers are compact and still provide full PC functionality with a Windows XP or Windows 7 operating system. Thus, the 8585 and 8595 ensure your workers are equipped with the tools they need to get the job done efficiently and effectively. The VC70N0 is the right-sized device for all your material-handling vehicles. Its compact design improves visibility and safety while still providing a large high-resolution display for all the information operators need to improve productivity and task accuracy, in almost any lighting condition. The powerful VC70N0 supports traditional Telnet to modern browser-based graphic-rich applications, covering receiving, put-away, replenishment, picking, packing and shipping. You get the flexibility to add the options needed to maximize efficiency - including corded or cordless barcode scanners, keyboards and a variety of voice capabilities. The MT800 is serving in TASHI Elfin integrated solution, running with a variety of major standard features such as door phone and security guard intercom. Its key role play is as a master controller in Home/Office sectors applying with Elfin to perform data and voice messaging, broadcasting, e-Home/e-Office lighting and scene control. Users also can adopt option with remote service via smart phone or tablet. MT800 with TASHI Elfin is heading to be a modern intelligent total IP based solution for both Residential and Commercial industries. The MT880 is an IP-based product with high speed Ethernet and WiFi communication. 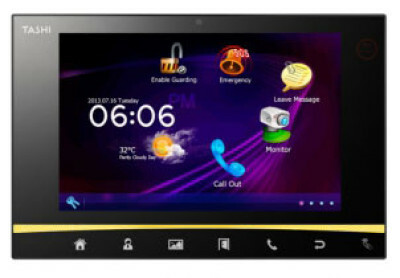 It features a beautiful 10.1” touchscreen and a user-friendly interface. With the MT880, you’ll be able to run home appliances, access gates, and intercom functions through your smartphone or tablet. Be in full command of lighting, alarms, temperature, electronic curtains, and access to your space with the MT880 control panel. With its modern shape, mounted at the lobby of corporate headquarters and mansions or at the entrances of residency and offices, MT200 enables the owners to demonstrate their extraordinary styles. Different from other door phones, MT200 is in line with international IP-65 waterproof / dust-proof standard that meets to outdoor installation requirement apart from indoor services. The VC80 fits in virtually any warehouse/material handling vehicle and features the Embedded Standard 7 or Windows 7 Professional operating system "" and it is Windows 10 ready. Programmable keys that simplify the most complex operations and the field replaceable touchscreen or optional keyboard can be used even with the thickest gloves. The DLT-V72 series is a rugged vehicle terminal designed for efficiency in logistics - meeting a wide temperature ranges from extreme heat to deep freezer environments - whether dry or humidity loaded. The integrated Advantech-DLoP low profile antenna solution provides high transmission quality in a very compact design. The DLT-V72 series is the perfect match for the most demanding logistic applications. The PC55 is an entry level, small and attractive price checker featuring the latest technology with interface options such as Wireless RF or hard wired Ethernet. Depending on the font set, the bright and vivid screen can display up to 20 characters per line. There is a choice of barcode scanners between the entry level single scan line CCD scanner and the high performance 24 scan lines omnidirectional laser scanner (2D scan engine is also available per customers request).